It’s like Carly Simon says if you are willing to play the game, its “Coming Around Again”. This time I’m talking about Mateus sparkling wine from Portugal. The oval dark green Mateus Rosé sparkling wine bottle is probably very familiar to my parent’s generation, and to me by assimilation. But for the younger people, GenX and Millennials, Mateus may not be on their radar. I read that Mateus is now aimed at the young, rich, busy professionals. So for those of you out there reading my review of Mateus, you may want to try a bottle. At BC $9.99 it is a bargain. 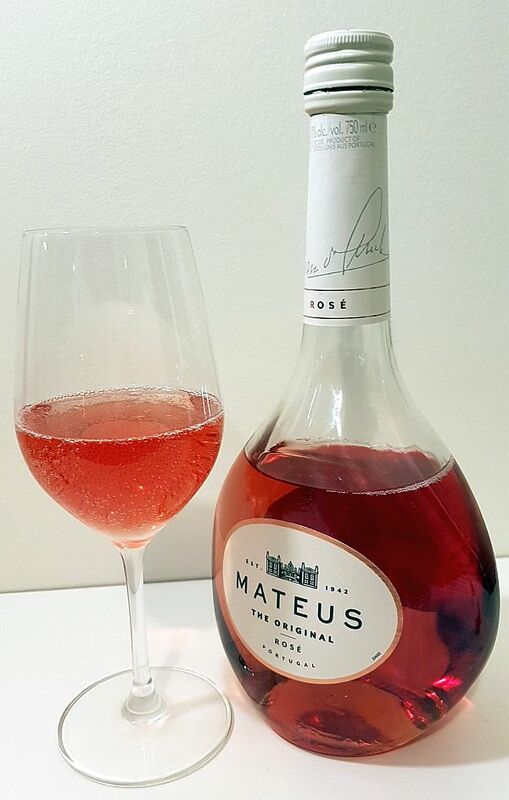 Mateus Rosé sparkling wine comes from Portugal and was first made in the early 1940s. The wine is made from a variety of red Portuguese grapes which include Baga, Rufete, Tinta Barroca and Touriga Franca. Not grapes that you normally hear of, like Chardonnay or Cabernet Sauvignon, but these are relatively well-known grapes in Portugal, and some of these grapes (Tinta Barroca and Touriga Franca) make it into Port wine as well. I don’t think the wine was ever made to be “serious”. It was a light, fruity, frizzante wine meant to be enjoyed. The wine is sparkling, but it is not made in the Champenois style or Prosecco method. Rather carbon dioxide is injected into the wine, to give it the bubbles. It is also non-vintage, meaning that the wine could come from grapes from different vintages. This does have the benefit of keeping a “house-style”, similar to other sparkling wines. Recently the bottle has been reworked, so it still has curves but is no longer as oval as the original bottle. I quite like the shape of the new bottle. It does catch your eye and would stand out on a wine shelf in your local bottle shop. The wine has a lighter sockeye salmon colour and has small bubbles that collect on the sides of your glass. It has a youthful medium intensity nose showing wild strawberries and tart red fruit, and with some air, red cherries. It is off-dry but has high acidity to off-set it. Some roundness. You get tiny biting bubbles up front, but they convert to a creamy mouthfeel from mid-palate to finish. Mostly red fruits and red cherry flavours, with a lesser amount of strawberries, and some black currant leaf toward the finish. I also picked up some saltiness (minerality from the grapes) in the wine. Lots of bubbles and the acidity in the wine creates texture in your mouth. The wine has a medium length that finishes with red fruit, cherries and bitter leaf. If you were to blind taste this wine, you would not probably guess this is Mateus; you would guess that is a sparkling New World wine. Rating: – Tart red fruits, strawberries and red cherries on the nose and palate. Lots of bubbles and high acidity for this wine add to mouth texture. Not complex; straightforward, and meant to just be enjoyed. Try it with fresh strawberries and watch Carly sing “Coming Around Again“. Here is the link to Mateus at BC Liquor stores.